Abstract: Panoramic image matching method with the constraint condition of local structure from motion similarity feature is an important method, the process requires multivariable kernel density estimations for the structure from motion feature used nonparametric mean shift. Proper selection of the kernel bandwidth is a critical step for convergence speed and accuracy of matching method. Variable bandwidth with adaptive structure from motion feature for panoramic image matching method has been proposed in this work. First the bandwidth matrix is defined using the locally adaptive spatial structure of the sampling point in spatial domain and optical flow domain. The relaxation diffusion process of structure from motion similarity feature is described by distance weighting method of local optical flow feature vector. 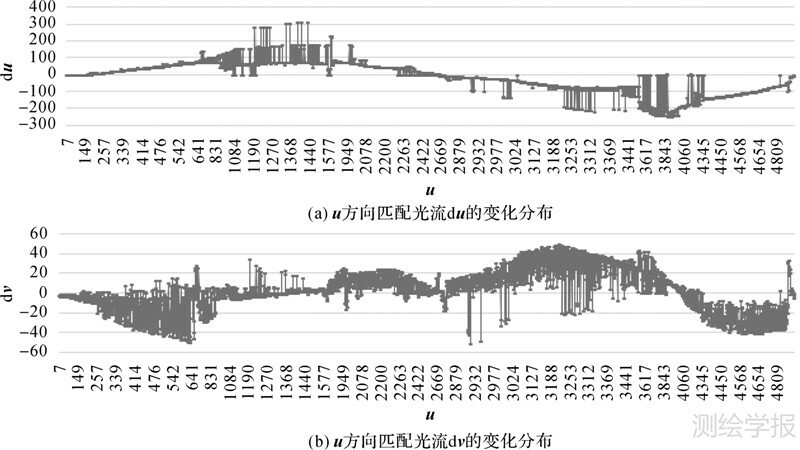 Then the expression form of adaptive multivariate kernel density function is given out, and discusses the solution of the mean shift vector, termination conditions, and the seed point selection method. The final fusions of multi-scale SIFT the features and structure features to establish a unified panoramic image matching framework. The sphere panoramic images from vehicle-borne mobile measurement system are chosen such that a comparison analysis between fixed bandwidth and adaptive bandwidth is carried out in detail. The results show that adaptive bandwidth is good for case with the inlier ratio changes and the object space scale changes. The proposed method can realize the adaptive similarity measure of structure from motion feature, improves the correct matching points and matching rate, experimental results have shown our method to be robust. MICUSIK B, KOSECKA J. Piecewise Planar City 3D Modeling from Street View Panoramic Sequences[C]//IEEE Conference on Computer Vision and Pattern Recognition. Miami, FL: IEEE, 2009: 2906-2912. TORII A, HAVLENA M, PAJDLA T. From Google Street View to 3D City Models[C]//IEEE 12th International Conference on Computer Vision Workshops. Kyoto: IEEE, 2009: 2188-2195. SATO T, YOKOYA N. Multi-baseline Stereo by Maximizing Total Number of Interest Points[C]//Annual Conference SICE. Takamatsu: IEEE, 2007: 1471-1477. MATSUHISA R, ONO S, KAWASAKI H, et al. 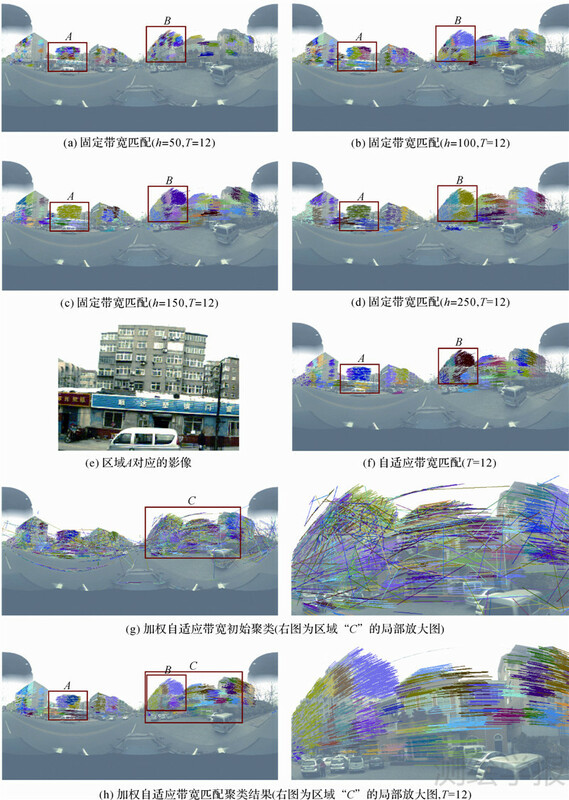 Image-based Ego-motion Estimation Using On-vehicle Omnidirectional Camera[J]. International Journal of Intelligent Transportation Systems Research, 2010, 8(2): 106-117. SATO T, PAJDLA T, YOKOYA N. Epipolar Geometry Estimation for Wide-baseline Omnidirectional Street View Images[C]//IEEE International Conference on Computer Vision Workshops. Barcelona: IEEE, 2011: 56-63. DEVROYE L, LUGOSI G. Variable Kernel Estimates: on the Impossibility of Tuning the Parameters[C]//GINÉ E, MASON D M, WELLNER J A. High Dimensional Probability II. Birkhäuser Boston: Springer, 2000: 405-424. BERLINET A, BIAU G, ROUVIèRE L. Optimal L1 Bandwidth Selection for Variable Kernel Density Estimates[J]. Statistics & Probability Letters, 2005, 74(2): 116-128. 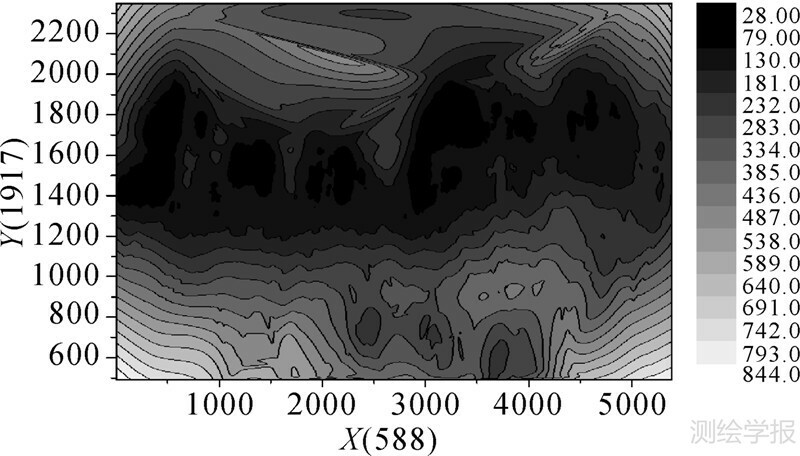 TURLACH B A. Bandwidth Selection in Kernel Density Estimation: A Review[M]. [S.l. ]: Université Catholique De Louvain, 1993. COMANICIU D. An Algorithm for Data-driven Bandwidth Selection[J]. IEEE Transactions on Pattern Analysis and Machine Intelligence, 2003, 25(2): 281-288. COMANICIU D, RAMESH V, MEER P. The Variable Bandwidth Mean Shift and Data-driven Scale Selection[C]//8th IEEE International Conference on Computer Vision. Vancouver, BC: IEEE, 2001: 438-445. GILANI S Z A, RAO N I. Data Driven Bandwidth for Medoid Shift Algorithm[C]//MURGANTE B, GERVASI O, IGLESIAS A, et al. Computational Science and Its Applications. Berlin: Springer, 2011: 534-546. MAYER A, GREENSPAN H. An Adaptive Mean-shift Framework for MRI Brain Segmentation[J]. IEEE Transactions on Medical Imaging, 2009, 28(8): 1238-1250. COLLINS R T. Mean-shift Blob Tracking through Scale Space[C]//DANIELLE M. IEEE Computer Society Conference on Computer Vision and Pattern Recognition: Vol 2. Baltimore: Victor Graphics, 2003: 234-240. COMANICIU D, RAMESH V, MEER P. Kernel-based Object Tracking[J]. IEEE Transactions on Pattern Analysis and Machine Intelligence, 2003, 25(5): 564-575. WANG Jue, THIESSON B, XU Yingqing, et al. Image and Video Segmentation by Anisotropic Kernel Mean Shift[C]//PAJDLA T, MATAS J. Proceedings of the 8th European Conference on Computer Vision. Berlin: Springer, 2004: 238-249. LOWE D G. Distinctive Image Features from Scale-invariant Keypoints[J]. International Journal of Computer Vision, 2004, 60(2): 91-110. SUN Deqing, ROTH S, BLACK M J. Secrets of Optical Flow Estimation and Their Principles[C]//IEEE Conference on Computer Vision and Pattern Recognition. San Francisco, CA: IEEE, 2010: 2432-2439." Acta Geodaeticaet Cartographica Sinica, 2015, 44(10): 1132-1141.